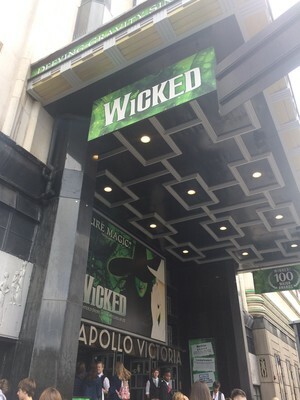 GCSE Music students recently enjoyed a 'Wicked' opportunity to experience first hand a practical application of music in a live entertainment setting. 'Defying Gravity', famously associated with the west end show 'Wicked', is one of the set works being studied at GCSE and a term 6 trip to London provided our music students with an ideal oppportunity to immerse themselves in the music and the show. Thanks are extended to Mrs Simes, who organised the trip having spotted an opportunity to bring the music to life, and to all the students who behaved impecably and made the trip itself just as 'Wicked' as the name of the show!